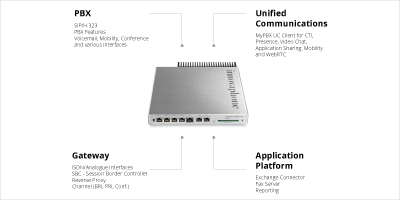 Each IP PBX comprises four elements: Gateway, PBX, Unified Communications, Application Platform. 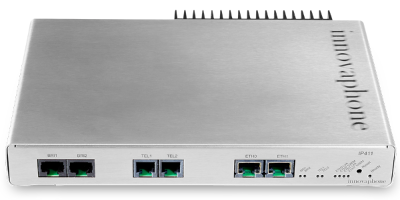 The innovaphone gateways serve as an interface to other networks, at the same time they provide the hardware plat- form for the innovaphone PBX VoIP telephone system and the Unified Communications solution. 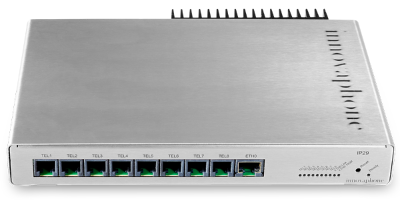 They can also be used as a Session Border Controller (SBC) and Reverse Proxy, in combination with other features or as a dedicated device. innovaphone provide a range of analogue adaptors to allow users to connect analogue devices such as fax machines, PDQ terminals, existing analogue door access systems and simple low cost POTS / analogue handsets. There are three options supporting 2, 4 and 8 simultaneous analogue devices, but multiple units can be deployed to expand capability, just one network connection is required.